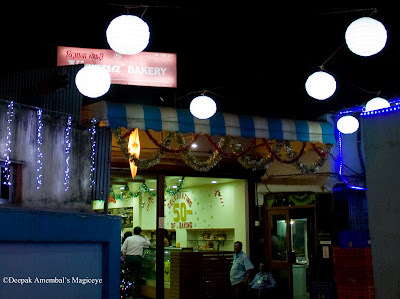 Vienna Bakery - A popular bakery in Vakola, a suburb of Mumbai, celebrating 50 years of baking! Snowman chilling on the lawns outside Cafe Coffee Day in Santacruz (East), Mumbai! A colorful butterfly adding to the riot of colors at the Sanjay Gandhi national Park in Mumbai! 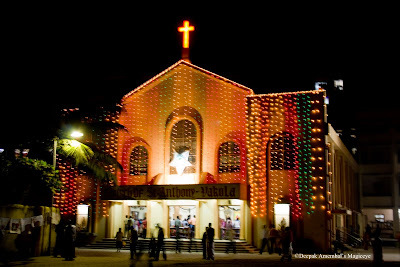 Twelve stars on sale at this shop selling Christmas decorations in Vakola, Mumbai. Dale from http://www.spunwithtears.com/thursday.html , the host of this wonderful meme, said Light and there was light at the Sewri mudflats in Mumbai! 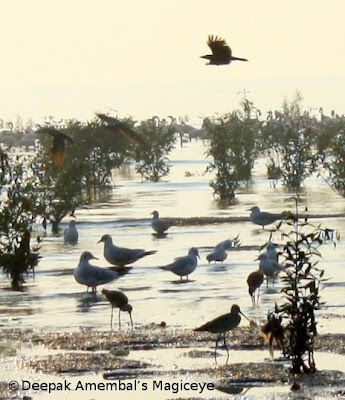 Wading birds and winging birds at the Sewri mudflats in Mumbai. An All India Handloom products Expo' at the Bandra reclamation exhibition grounds. Morning has broken at Sewri mudflats in Mumbai! Spider suspended at the Sanjay Gandhi National Park in Mumbai. Fast fluttering wings of a butterfly at the Sanjay Gandhi National Park in Mumbai. 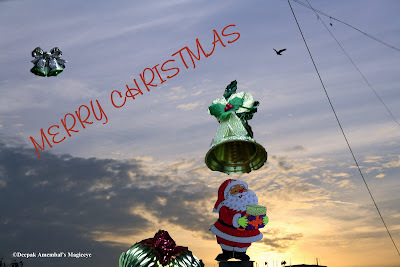 The Mumbai sky as seen on 03dec09 at 1806hrs. Puppets decorating the stall at the Indian handicrafts exhibition in Bandra, Mumbai. Apologies for the blurry picture. Viewers at the mudflats in Sewri, Mumbai to view the flamingos flock and feed. Dawn at the mudflats in Sewri, Mumbai. Dawn at the Mudflats in Sewri, the place in Mumbai which has flamingos flocking for their favorite algae in winter. Butterfly flitting around at the Sanjay Gandhi National Park in Mumbai. Undesirable are the cables that run across the skies! The Mumbai sky as seen on 03dec09 at 1756hrs. The writing is on the wall in 3 languages, Marathi, English and Tamil to announce the place which has the world's largest menu for Dosas (something like pancakes). This cafe is in a mall in Mulund, a suburb of Mumbai. Homeless in a world of glitter. A world of contradictions. A slice of life on a sunday evening on the streets of Bandra Kurla Complex - the neo corporate hub of Mumbai. A quiet Sunday late evening at the Bandra Kurla Complex. A butterfly at the Sanjay Gandhi National Park in Mumbai. 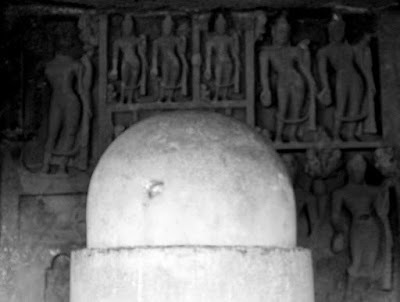 Curved stupa and figures carved on the wall at the Kanheri caves in Borivali, Mumbai. The Mumbai sky as seen on 03Dec09 at 1735hrs.